Browsing the Centersphere, I noted Sol Kleinsmith of "Rise of the Center" "Uniters.org" worrying about the state of the political center in American politics. In his "Must Read" post last week, he quotes a National Journal article "The Center Falls Apart:"
"National Journal's vote ratings in 1982 found, to cite just one example, 60 senators who could credibly be described as operating in the ideological middle. Back then, 36 Democrats and 24 Republicans voted in ways that put them between the most liberal Senate Republican, Lowell Weicker of Connecticut, and the most conservative Democrat, Edward Zorinsky of Nebraska. The number of those in the broad middle in the House was 344... In the most recent Congress, not one senator fell into this middle category. In the 111th Congress, not one Republican fell into the ideological spectrum between the most conservative Democrat, Ben Nelson of Nebraska, and the most liberal Republican, George Voinovich of Ohio. Neither did any Democrat. In the House, the number of in-betweeners fell to seven (even after Newt Gingrich’s 1994 “revolution,” the House number had been 226)." "The Center is Rising… its just we’re rising from almost nothing, and we don’t even have a foundation to start from, so we have a lot of work to do before we can mount a real opposition." I knew IndependentVoting.org is a liberal group, stating openly that they’re the “Progressive Wing of the Independent Movement”, but I thought they’d set that aside, ala No Labels style, for a conference of independents. Instead I heard just as much vilification of the right at this rally as you would find a meeting of democrats. Calling this even the Conference of Independents makes as much sense as their spin, and outright lies, on Top Two “Choke Point” Primary rules, their claim that Obama is (I kid you not… Jackie Salit says this all the time) an independent and their doublespeak calling what is going on with independents around the country is a movement." He is completely correct about the political proclivity of the organization. They are as committed to a progressive "big government" agenda as the most liberal wing of the Democratic Party. But it is also true that as an organization, they can legitimately claim a historical provenance to the single most significant Independent voter "foundation building" of the modern era - the Perot Reform Party. Despite Kleinsmith's assertions to the contrary, an Independent voter foundation was built and still exists. The Reform Party did build an Independent foundation, and that foundation remains the underpinning of the Independent Voting organization today. "This is an exciting and challenging time for independent voters and for the independent movement. Independents are now 40% of the electorate. Polls show that 41% of college students consider themselves indies as do 35% of African Americans under the age of 30." One problem Kleinsmith (or Salit or anyone) faces when looking for an Independent "movement" or "coalition" on which to build a foundation is the well documented fact that the majority of voters self-identifying as "Independents" actually vote as partisans. In fact they vote so reliably partisan that they cannot be distinguished from those self-identifying Democrat or Republican based on their voting record. "A granfalloon, in the fictional religion of Bokononism (created by Kurt Vonnegut in his 1963 novel Cat's Cradle), is defined as a "false karass." That is, it is a group of people who outwardly choose or claim to have a shared identity or purpose, but whose mutual association is actually meaningless." How voters self-identify in a self-serving response to pollsters may be mildly interesting but it is not a basis on which to build a political movement. Anyone purporting to identify a meaningful Independent coalition must be able to answer four questions with crystal clarity about their potential base. Who are they? What are their numbers? How are they organized? What are they voting for? The only firm ground on which a sound political foundation can be built is a significant group of voters that can be shown (or be convinced) to vote in a consistent and coherent way. This requires organizing a vote around something (anything) tangible. Historically, the most meaningful 3rd Party or Independent efforts have organized around personalities (Perot, Nader, Anderson, Wallace, Roosevelt), and they are meaningful only to the degree they succeed in affecting national elections as spoilers. If he chooses to run, Michael Bloomberg has the potential to fulfill that role in 2012, with exactly that effect. There is no history of a third party succeeding in American politics, unless one of the two major parties self destructs, and is replaced by the new party, still leaving only two parties standing. Effective voting coalitions can also be organized around single issue politics. A candidate issue must evoke intense passion to be effective. Examples include war, abortion, segregation, gay marriage, discrimination and most recently - irresponsible deficit spending. Call me a cynic, but I just don't think that demanding polite and civil debate is a sufficiently compelling issue to organize an effective voting coalition. Even issues that evoke intense passion tend to be short-lived as effective Independent organizing principles. The movements built on them tend to remain independent for only as long as it takes one of the major parties to co-opt and subsume the issue into their partisan base. It is important to be realistic about the size and nature of the truly Independent vote that can actually be seen to swing from one election cycle to the next. The best analysis I've seen over the the last few cycles comes from The Cato Institute. In a series of policy studies, they've identified a "fiscally conservative, socially liberal" voting block that has been documented to swing in the 2002, 2004, 2006, 2008, and 2010 elections. The Cato Institute being the Cato Institute, it identifies these voters as closet libertarians. That identification is a reach. These voters do not self-identify as libertarian, and many would recoil from strong libertarian positions. Whatever you want to label them, these voters represent the real Independent voting base in the electorate. They can be measured, they can be identified, we can understand what they are voting for and against, and they swing their vote in a measurable predictable way. They represent 14% of the electorate. That is your Independent voting base. If you want to build a realistic voting strategy and political strategy around Independents - recognize first that your strategy is based on, at most, 14% of the vote. Anything else is building on sand and mirage. This begs the question - how do you herd these cats? And if you do herd them into a voting block, how do you avoid the spoiler effect with only 14% of the vote? "The answer really is simple. We need to elect more moderates and centrist independents, and we need to not allow either party to have complete control of government anymore. We need to have split government at every level, to at least force the two parties to have to gain the support of a handful of non members to pass anything. They just can’t be trusted anymore." "At Rise of the Center, Solomon makes the case for multi-party government on the basis of one simple fact: the Democratic and Republican parties cannot be trusted with power." This idea sounds vaguely familiar to me, and I'll get back to you if I can recall where I've heard this before. In the meantime what I think both Eris and Kleinsworth miss, is another benefit of a divided government voting heuristic. Divided government not only helps keep both major parties honest, it is an easily understood and easily communicated tactical organizing principle for herding those 14% truly Independent cats. Alas, many are called, but few are chosen. Many will agree "in general" with the notion that divided government is a good thing, but few will specifically vote against their natural partisan inclination to maintain that state. Kleinsworth and Eris will be an interesting test. They are both self-described independent centrists, but see different solutions to the two party hegemony in our political system. Kleinsworth thinks the solution is electing moderate centrists in both parties. * Eris thinks the solution is a viable third party. * Both express distrust of one party rule. The question is - How will they vote in 2012 if, as it looks now, the only logical divided government vote will be a vote to re-elect Barack Obama? Done. Got an early start on the Coalition of the Divided this cycle. The C.O.D. 2012 Election Edition is up and running. 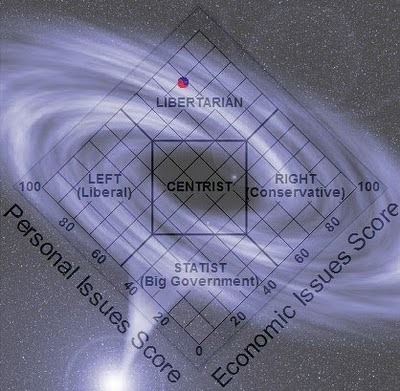 Modified the image at the top of the post to include The Dividist's location in the Nolan Chart firmament orbiting the Centrist black hole. 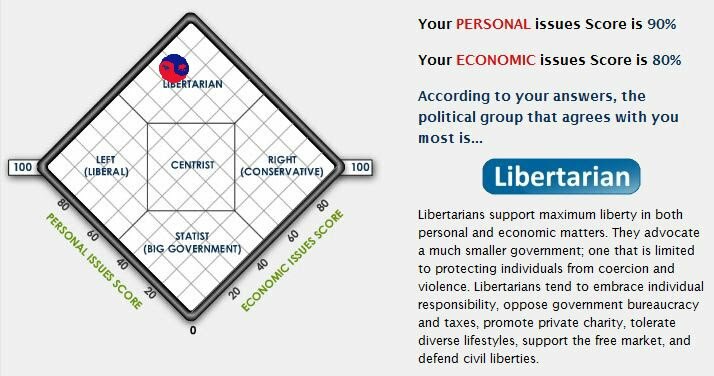 A better image of my Political Quiz test result can be found here. This in preparation for cross-posting a tighter version of this at the Donk, incorporating some of the constructive criticism found in the comments and elsewhere.. Speaking of which, the Dividist notes that Damon Eris at Poli-Tea has also weighed in with a thoughtful critique. Misguided and wrong, but thoughtful. The Dividist will need to cogitate on this a bit, and better understand the concept of a "fractal fallacy" before responding - probably over the weekend. I actually like a lot of the stuff that Kleinsmith does, but this makes me wonder whether the guy has some reading comprehension issues. Either that, or he did not actually read this post. I don't really care whether he reads my stuff, I just don't understand why he would post such a virulent reply without bothering to read and understand the post first. Nowhere in this blog post (in fact, nowhere in any of the posts I've written over the almost 5 years of blogging at DWSUWF) did I say anything remotely like "independents can't vote for one of the two major parties". In fact, that is the exact opposite of the voting heuristic I promote on this blog. I advocate that a percentage of the true Independents (those who do not vote identically as partisans) should always vote at the federal level in a manner that would prevent either major party from controlling the executive and both legislative houses. To whit - always voting for divided government. That means as a practical reality, I am advocating that true independents should almost always vote for one of the two major parties at the federal level. In the last election that meant voting straight GOP for the House and Senate. In the next election it means voting to re-elect Barack Obama, as that is likely to be the only way to avoid One Party Republican Rule into 2013. Yes, it is conceivable that a third party vote could be considered a "divided government" vote, because of the spoiler effect. For a hypothetical example, should Mike Bloomberg run as an independent in 2012, he would have no chance of winning, but would likely have a similar effect as Perot did in 1992 drawing more from the GOP vote and contributing to the election of a Democratic President. A vote for Bloomberg in 2012 instead of a vote for the GOP challenger would also be a vote to reelect Obama and retain divided government. Interestingly, Kleinsmith does not seem to notice that his less-than-civil outburst is more critical of the political theme of the Poli-Tea blog than it is of my blog. As I read this, it is actually D.Eris at PoliTea who is specifically advocating that Independents should almost never vote for one the two major parties. Perhaps Kleinsmith is having as much trouble comprehending what Eris' blog is about as he is comprehending mine. My sense is that all three blogs have similar policy goals and see independents as the key to a voting strategy to get there. PoliTea (PT) advocates that Independents should strategically vote for 3rd parties. Kleinsmith's Rise of the Center Uniters.org advocates that Independents should strategically vote for Moderate/Centrist/Polite candidates. Here at DWSUWF I advocate that true Independents should first and foremost tactically vote for divided government. Of the three, I submit that the divided government voting heuristic has the greatest likelihood of succeeding for the foreseeable future, and having an actual policy impact on our federal government. This is all about how to organize the Independent vote in a predictable and meaningful way. The Kleinsmith Uniters strategy is problematic on two counts. First, it is difficult enough to try and herd the Independent voter "cats" without trying to organize around a concept as ambiguous and as subject to partisan interpretation as whether a candidate is actually moderate/centrist/polite enough to deserve the Indy vote. Look no further than the very next post on the PT blog, where Kleinsmith is arguing with another Indy on whether Obama is a centrist, to see this problem in action. Second, is a problem that Kleinsmith shares with the PT blog, which is overstating the size of truly Independent vote. Yes, it is a fact that something like 40% of the electorate self-identify as Independents. The problem is that 2/3 of those so-called Independents have voting records that are indistinguishable from those voters self-identifying as partisan Republicans and Democrats. The problem is not that they vote R or D. The problem is that they are in fact functional partisans by the way they vote at the Federal level. 1/3 of the "Independents" always vote like partisan Republicans. 1/3 of the "Independents" always vote like partisan Democrats. This is not a "fractal fallacy". This is documented historical fact. They are not voting that way because they don't have other choices. They vote that way because they are more comfortable with and lean toward one party or the other, and where the rubber meets the road, in the voting booth, they are in fact pure partisan voters at the federal level. The correct way to view the electorate as a practical voting reality, is as 86% Partisan, split down the middle, with a 14% Independent swing vote. Any voting strategy that presumes or requires something different to succeed, is built on sand. Will try to get back to this later. That's what they told Mozart - too many notes. I needed to keep myself occupied while my wife made me watch the Oscars with her. My God, man, what did you do that she insisted on exacting such an unhuman revenge? I cut a bad deal. She watched the Superbowl with me. I lost on both ends of that deal. I could've told you that any deal required to get a woman to watch football with you is going to turn out bad. Bad bad bad. "Despite Kleinsmith's assertions to the contrary, an Independent voter foundation was built and still exists. The Reform Party did build an Independent foundation, and that foundation remains the underpinning of the Independent Voting organization today." I'm not talking about a psychic foundation, I'm talking about a real foundation. The rise of the more liberal part of the democratic tent was preceeded by years of interest group foundation building. The rise of the more conservative part of the republican party was preceeded by years of the same on their end. Having millions of people who agree with you in principle means nothing unless you have a framework through which they can focus their collective energies. After the Reform Party fell apart, that foundation went away. "It is built on the illusion that there is a large and viable independent voting coalition in the American electorate." My contention is, and this is easily backed up by polling data that I'm sure you're familiar with, that a plurality of the American people are less liberal than democrats, and less conservative than republicans. These centrist to moderate left and right leaners agree on political issues as much as the two major parties used to internally, before they started getting taken over by ideologues. But a movement doesn't come from nowhere. There needs to be a network, a foundation if you will, of think tanks, issue orgs, grassroots groups, candidates and media entities to keep it rolling. The Reform Party started from the Top Down... built a house on naked ground. The foundation doesn't exist now, but the raw materials do. If we want something to happen in the medium to long term, to fight back against the extremism on both sides, we need to stop pinning our hopes on billionaires, and start building at the local level, and/or starting other entities necessary for that foundation. No Labels is the closest thing to this, although some think tanks are moving that direction as well, with more centrist work being done than liberal or conservative. Eliot Cutler, Lincoln Chafee, Rick Snyder, Michael Bloomberg, Olympia Snowe... these are our leaders right now. As the two major parties continue their move away from the center, more and more of these will be pushed out, and more and more people will run as independents. Uh. No matter what they call themselves fiscally conservative socially liberal sounds pretty libertarian to me. You could also call it the Leave Us Alone Party. BTW this is no time for moderation. You want us to go broke half as fast? Once the money is fixed I'm switching sides to strengthen the "social liberal" side. In other words - I'll settle for serial balance with the object - smaller government. "Uh. No matter what they call themselves fiscally conservative socially liberal sounds pretty libertarian to me. You could also call it the Leave Us Alone Party." Libertarians go MUCH farther both ways than centrists do. "BTW this is no time for moderation. You want us to go broke half as fast?" Neither side is willing to do a damn thing about the budget. Both sides have to give to reach any realistic path towards solvency, like the fiscal commission's recommendations. Its no surprise that moderates are the biggest champions of these things, the worst partisans on both sides are so beholden to their interests that they'd rather see the country go bankrupt than vote on something that would require their side to share in the pain. Trying to control government by dividing it is like driving a car with overly-sensitive steering: Turn left! Too far, turn right! Too far, turn left! Eventually, you'll go spinning out of control. If you want independents--or moderates or centrist or whatever you want to call them--elected, then consensus-seeking election methods are absolutely necessary. Either single-winner elections with approval or range voting, or a method of proportional representation. Anything else favors voices toward the extremes. Even if 80%* of voters think the choice on the left is too-far-left, and 80% of voters think the voice on the right is too-far-right, then it's impossible for any solitary 3rd-party choice to win. Consensus-seeking elections would keep us on the correct course, without constantly over-correcting. I think it worthwhile to first note that to a very large degree we are closely aligned on most issues, and in complete agreement about the destination. The questions I raise are about the most practical path to get there. Even so, our differences could be characterized as tactical vs. strategic. Now, I wouldn't quite characterize it that way myself, just saying it could. I would characterize more like practical political reality vs. wide eyed fantasy. But that is just me. In any case, a real political movement needs both. That said, I want to correct a few items in your comments. If yo go back and reread that paragraph, you'll see that the "it" in the sentence you objected to was referencing "Independentvoting.org", and not referencing "Kleinsworth lament". Although, I will admit I could have written that more clearly and I can see why you read it the way you did. So - on that point, I was actually saying the same thing you did in your comment, that the foundation of that organization has rotted away. I'll also stipulate to your assertions about the nature of the moderate middle (less lib then dems, less conservative then Reps). That is not the point. The point is that the rubber meets the road in the voting booth. You have to look at how they actually vote. The majority of those independent Centrists vote exactly like partisans. It is not because they are deluded or idealogues hve commandeered the parties.It is not because they have no choice. It is because it is human nature to move to a comfort zone when faced with decision or controversy. The comfort zone is the party they lean toward. This is well documented voter behavior. There is a smaller subset of that group that will actually change their party vote on an election by election basis. That is the group that is available to organize around a common political goal now. You know this to be true. Tell me what happens at "No Labels" every time a real substantive issue is put on the table in the discussion groups? Do you see these self-selected Centrists rally around a common solution? Or do you see it segment immediately into a familiar partisan divide with a much much smaller subset willing to embrace a compromise? That smaller subset is all you have to work with there, and it will be a different subset on each specific issue. Look - you are absolutely right about all the kinds of nuts and bolts / grass roots / think tanks / etc. etc. efforts needed to build a real movement. I applaud you and support you in this endeavor. I just think there is a much simpler, straightforward, more attainable goal - which is to try and organize a smaller base of voters (half the "real" independents? 5-7%?) to be a consistent vote based on a simple and easily understood organizing principle, with a potential real political consequence of forcing moderation and compromise at the Federal level. These are not mutually exclusive strategies. Think of it this way. The patient is bleeding out in the middle of the road. A crowd of 35 Independent Centrists have gathered around the scene of the accident. You are saying "C'mon everybody! Lets all work together to build a hospital for this guy!" I'm saying, "OK, but I need five guys right now to put a tourniquet on him, apply CPR and get him off the road." "a thoughtful critique. Misguided and wrong, but thoughtful." Tying off some loose ends and responding to some of the other comments. I embedded my reply in an update to the post itself, as I had problems commenting on your blog. The problem with labeling the truly Independent 14% swing vote as libertarian is the opposite of the problem with the 40% who self identify independent. The self-identified independents mostly aren't, while the 14% do have libertarian tendencies, but do not self-identify that way. In the past, I have called them "libertarianish". Probably as good a label as any. BTW - I am taking your comment as an endorsement of divided government, so you have now earned your third consecutive appearance in The Coalition of the Divided.Congratulations! Proportional representation smacks of Parliamentary systems. You can argue the merits of a European style Parliamentary Democracy vs. our Constitutional Presidential / Divided legislature system, but that is the system we have. I like it better, and think the likelihood of our ever moving to a proportional parliamentary system to be so remote as to be non-existent and frankly, not worth worrying about. I appreciate all the comments and feedback. My intent is to do a rewrite and try to tighten this up a bit (operative word "try")- then post at Donklephant to keep the discussion going. Stay tuned. An invitation to anyone who actually completed the long slog through this post and comments: I am interested in doing an unscientific mapping of where readers of this post may fall in the Nolan Chart Universe orbiting the Centrist black hole at the top of the post. I will update the image with any in the commentariat who let know in the comments or e-mail of their results on the Political Quiz. Yeah - I know all the problems with this quiz. We'll use it anyway. Its easy. My e-mail is mw AT dividist DOT com. hey MW, just saw your final, lengthy update today. Judging from your response, I think you've misunderstood two specific points I made in my post at Poli-Tea, which I assume is a result of lack of clarity on my part. Yes, there are 40% self-described indies. And I agreed that, judging from the way they vote, many are indistinguishable from weak partisans. But I disputed the percentage of Independent Independents which you pegged at 13-14% on the basis of the CATO study. As I show in the post and in the previous post dissecting the study on which the Miller-Mccune article is based, 13-14% is very likely an underestimation of the viable Independent vote. I would place it at around 20% of the national electorate. Secondly, the fractal fallacy is using national polls as indicative of the ideological/partisan/political breakdown in any given state or locale. The fractal fallacy is the assumption that any given state or local district will reliably reflect the nation as whole. Nationally there may be 30-40% of the electorate who call themselves indies, and 20% who could be considered reliable Indy voters. But the numbers are quite different in different states and locales. In some states Independents are the MAJORITY. My example was Rhode Island. The majority of registered voters there are Independents. They elected their first Independent governor last year. (There are at least 10 other states in which indies outnumber D's and R's combined, and a few more in which they outnumber one or the other.) Now, RI has divided government, with an Independent governor and a Democratic legislature. Finally, I would take your call for divided government and raise you one. Divided government is considered to be control of the executive by one major party and control of the legislature by the other. More superior would be a legislature which is itself divided such that NO PARTY HAS MAJORITY CONTROL. The election of just 3 or 4 more Independents in the US Senate would ensure this. Just a few dozen Independents and third party candidates in the House would do the same. This comment included as a pointer - I see Damon Eris' raise and respond to his thoughtful comments in a future thread - linked here.